The 11th Century The Church in 1050 During the 10th century it was popularly believed that the world would end at the year 1000 (the millennium) and consequently very little permanent building work was carried out in the latter half of that century. However, when the year 1000 Came and went uneventfully there was a great revival in building, particularly of churches, and our parish church owes its origin to this period, the llth century. 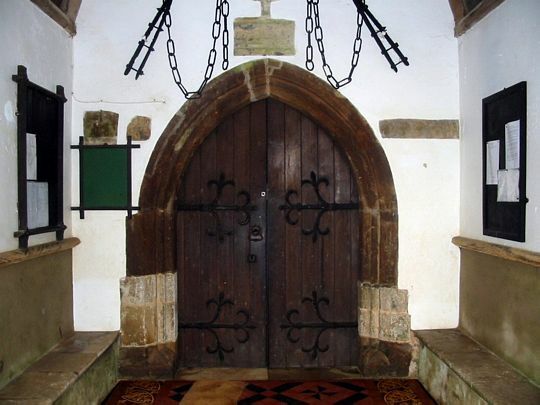 It is possible that the original Saxon church, although primarily of timber, may have contained one portion in stone, which could have been incorporated into the new church when it was built alongside the old. This could account for the odd alignment of the old north transept (See Figure below), which is still discernible in the present building in the most easterly arch of the north arcade. 11th Century Floor Plan The original llth century church (Above) is thought to have been begun in about the year 1050, and to have been cruciform in plan. Evidence of the north transept still exists, but there is no definite evidence of a similar south transept. Much of the south wail of the north transept still remains and its south west corner is marked by a break in the wall above the present pulpit, and a corresponding straight joint in the masonry of the clerestory walling above is visible externally, although partially obscured by a rainwater pipe. The arch between the nave and the north transept seems to have been reformed or enlarged in the following 12th century, but the still existing stone corbel above it supported the original lower nave roof, and indicates that the transept was higher than the nave. The outline of the east gable of the original nave can be still seen in the remaining raking string courses externally above the chancel roof, and the east wall of the present nave on either side of the chancel arch is doubtless original. 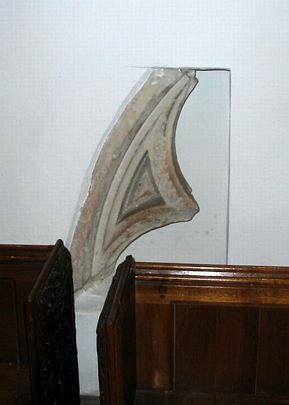 On the south side, below the later hagioscope, are the remains of the jamb of an opening which may have been the south jamb of the original chancel arch or of a flanking recess. 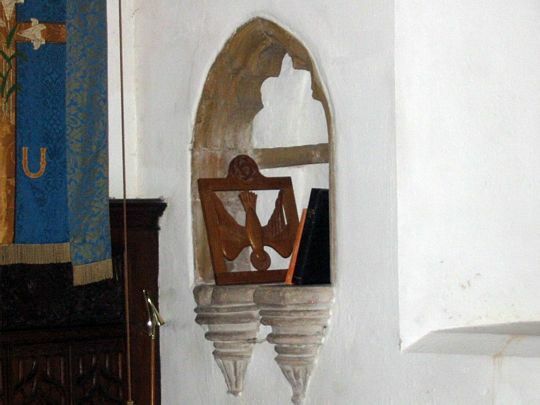 To the left of and above the hagioscope there is an original ornamented arch stone (See Photograph below), and a similar one occurs in the outside wall of the rebuilt south porch, both of which may have formed part of the original chancel arch or flanking recesses. Apart from possibly the core of the westerly square pier of the north arcade which marked the north west corner of the original nave, no other parts of the original ilth century church remain in situ above floor level, having been removed in subsequent extensions. South Hagioscope (click to enlarge) Although the original chancel has been entirely removed its former dimensions are known, as an excavation carried out in August 1963 revealed portions of its foundations in the form of large flints bound together with a mixture of chalk and clay. It can be seen (Diagram below) that the later chancel was for some reason built with its central axis a little north of that of the nave, and it was thought possible that the original chancel might have been on the same axis and of the same width as the original nave, and that if this were so, the foundation walling would have lain outside the perimeter of the present building along the south wall of the chancel. 13th Century Floor Plan This proved to be the case and the foundations began to appear at a depth of about 1 foot (30cm) below the existing ground level. 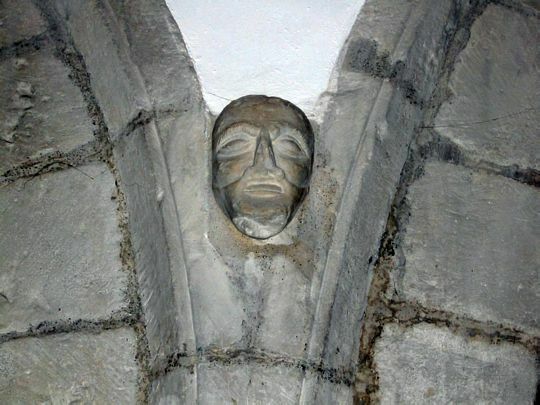 Although somewhat disturbed and displaced by grave digging close under the chancel wall at various times in the past, sufficient remained to show that the original chancel was some lft. 3in. (37cm) wider than the present chancel, and therefore the same width as the original nave. Its length was 18ft. 6in. (5.5m) coinciding approximately with the present step in the chancel floor at the altar rail. A trial excavation on the north side to discover confirmatory evidence was abandoned when 1875 concrete underpinning was encountered. The 12th Century The Church in 1160 About the middle of the 12th century, just after the pointed arch had been introduced, but when traditional Norman ornament was still being used, sometimes known as the Transitional Period, the original cruciform church was enlarged by forming an arcade of three arches in the south wall of the nave and adding a narrow south aisle (See Figure below). Mid 12th Century Floor Plan The aisle itself has disappeared through subsequent enlargement, but the mid 12th century arcade still remains. Originally it terminated in semi- circular attached half columns at each end, and although that at the east end has since been replaced, the half column at the west end remains, as it was retained and incorporated as part of a subsequent isolated column. 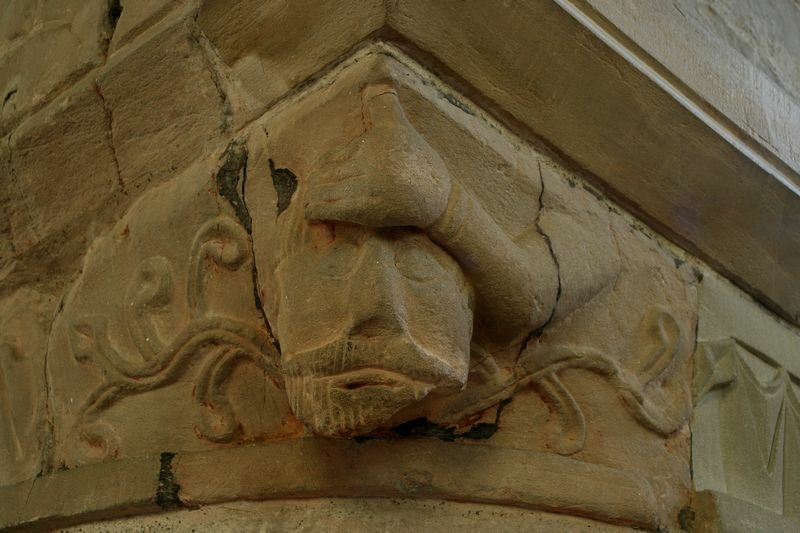 The two central columns are circular with square capitals and bases, and are interesting for the carvings at the corners of the capitals (Photographs below) depicting (A) a man's head with mouth held open by the hands, popularly held to represent a sufferer from toothache, (B and C) a man's head with a hand held to the forehead, popularly considered as representing headache, (D) a dog biting the ear of a wolf or bear, believed to represent the mediaeval sport of bear-baiting, (E) a crowned head, and (F) a monkey. One of the carvings (B) appears to be an 1875 restoration, but the remainder are original. 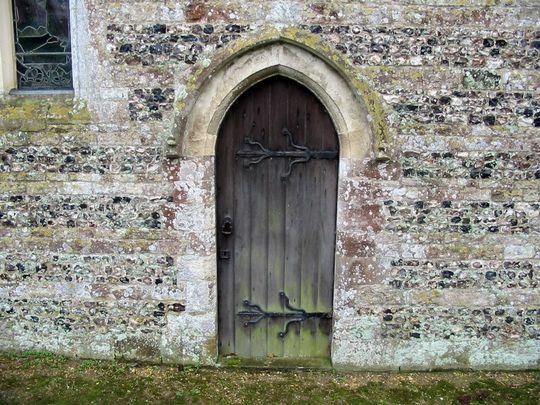 There is a nail head patterned architrave over the arches on the nave side, and two carved heads (G and H) occur above the intersections of the arches on the aisle side. 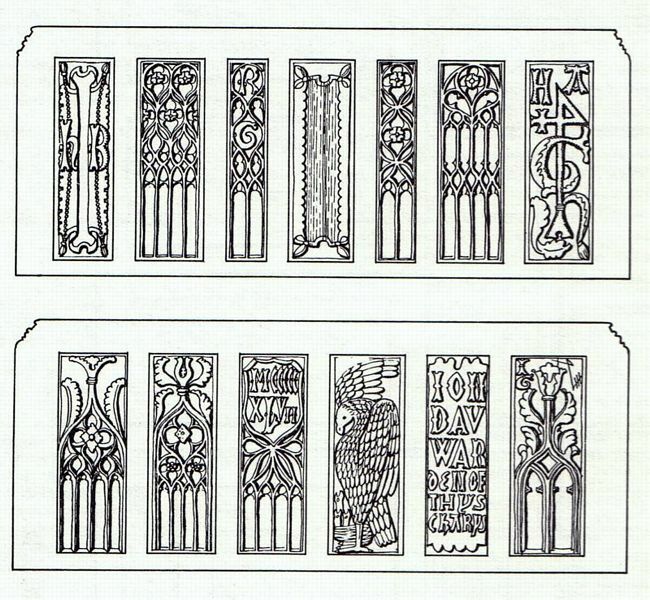 Carvings at corners of capitals (Click for full image) (Top Row L-R - A,B,C. Middle Row - D,E,F, Bottom Row - G,H) The crowned head on one of the capitals (E) in association with the mediaeval sporting scene at one time gave rise to the supposition that the building of this arcade and aisle was financed by King John who frequently visited Bere Regis, but this cannot be so, as the arcade must have been built at least 40 years before the beginning of his reign. At the end of the 12th century the church was further enlarged by forming an arcade in the north wall of the nave and adding a similar narrow north aisle (See Figure below). Again, the three arches remain, and although similar in shape and size to their counterparts on the south they are devoid of ornament and carving, and the outside arches sprang from corbels in the end walls instead of from half columns. 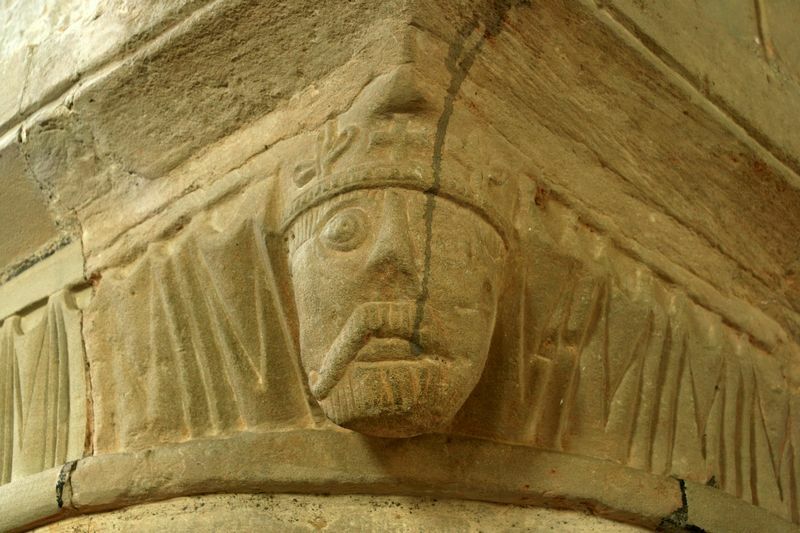 This corbelled springer remains in situ at the east end, and the painted consecration cross below it is thought to date from about 1200, probably marking the completion of this arcade. The 15th Century The Church in 1486 The roof loft appears to have been added at the beginning of this century, and the three surviving supporting stone corbels show it to have been an exceptionally large one occupying the whole of the eastern bay of the nave. 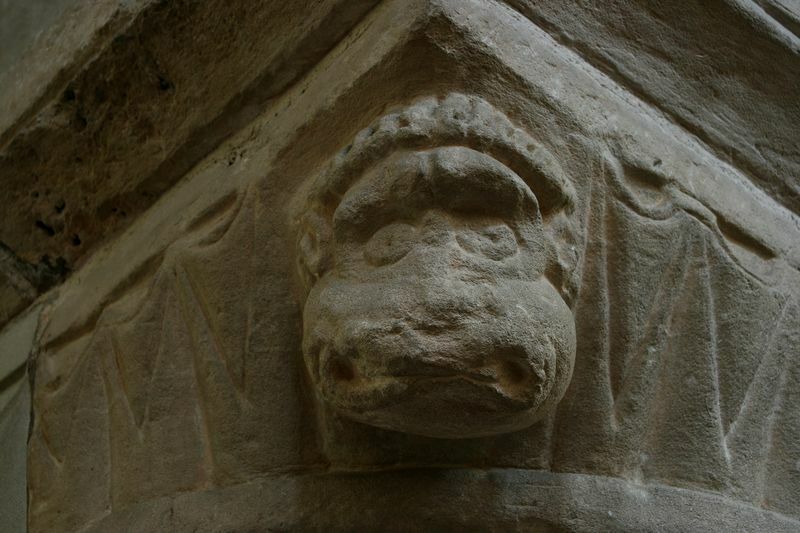 The remaining rear corbel is plain, but the two front ones are ornamented with carved figures and date from about 1400. 15th Century Floor Plan Two old wooden seats in the chancel (See photographs below - click to enlarge) which belong to the early part of this century contain linenfold panelling, and the side of one of them shows evidence of once having had a curved seat, usual in times when clergy were not allowed to sit (at least comfortably) during services. 15th Century wooden seats During the restoration work of 1875, signs of a previous fire were said to have been observed, and it seems probable that such a fire might have occurred about the middle of the 15th century. Apart from improvements and extensions, a great deal of rebuilding of existing work was carried out, much of it only dating from the previous century. 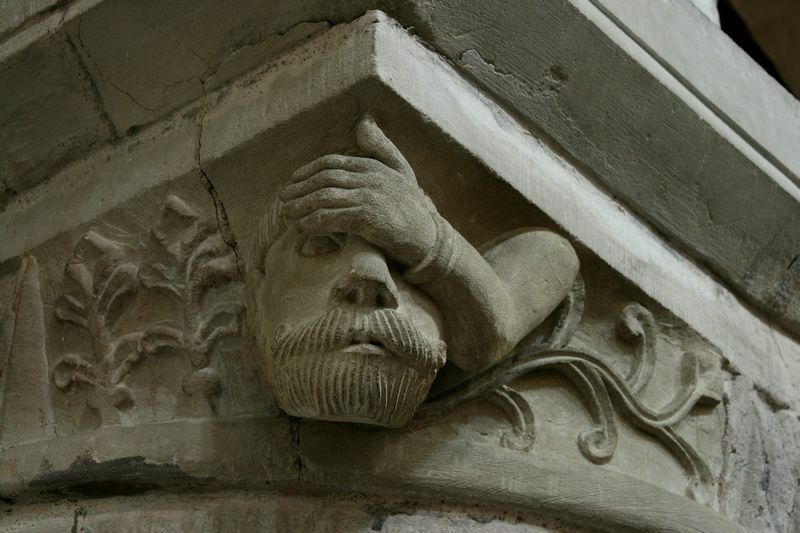 It appears that in 1450 money was being collected for the repair of the chancel, and shortly afterwards it seems to have been largely rebuilt as a result. 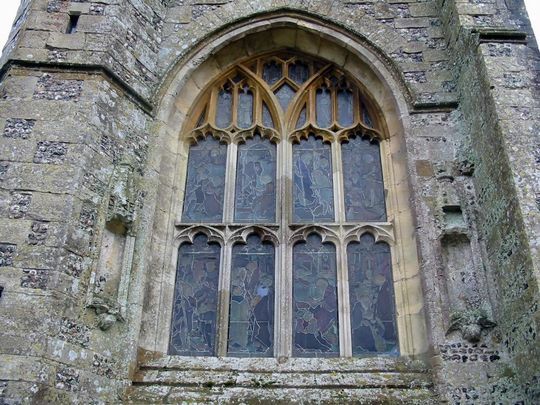 Any existing windows were replaced, and new ones were added (See photograph below), but the lower portion of the 13th century east window was retained and a typical 15th century traceried top added, which may also be seen in pre 1875 engravings and photographs. 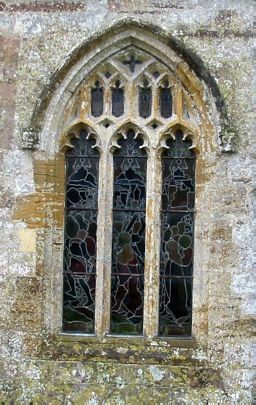 Chancel 15th Century North & South windows (click to enlarge) At the same time a priest's door was added in the south wall (See photograph below), decorated with carved paterae, and the whole of the external walling appears to have been refaced or rebuilt. 15th Century Priest's Door The large amount of work carried out during the last quarter of the 15th century is thought to have been due to the influence of Cardinal Morton who was a native of Bere Regis, having been born at Milborne Stileham which then formed part of this parish, and who was said to have been "much given to building". 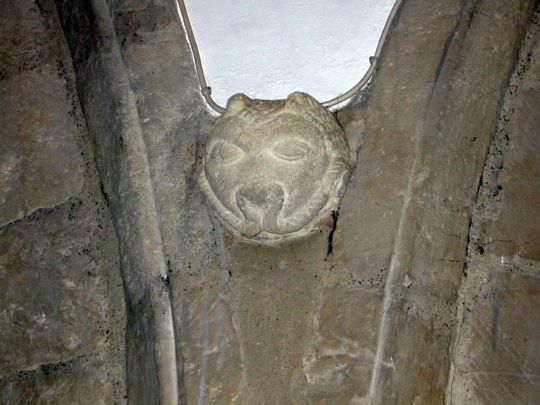 In about 1485 the old nave roof was removed and replaced by a new one at a higher level, incorporating clerestry walling and windows with trefoil headed double lights (See photograph below - click to enlarge). The old north transept which had probably developed into a tower, was retained however, and the joint in the masonry where the new clerestory walling abutted it can still be seen externally. It also meant that at this point there could be no clerestory window, and the one which now exists in this position can be seen by its plain top to have been inserted early in the following century when the tower was removed. 15th Century Clerestry walling & windows At about the same time the old narrow north aisle including its westward extension carried out in the previous century, was taken down and rebuilt to its present width with new cinquefoil headed windows (left photograph below) in the north wall and an unusual triangular headed window (right photograph below) in the west wall. The roof at this period was probably a shallow double pitched roof, the supporting corbels of which still remain, but it has since been replaced by a single pitched roof at a slightly higher level. Pre 1875 engravings and plans show that there were several more buttresses on the north wall than at present, and that the north doorway was further east. 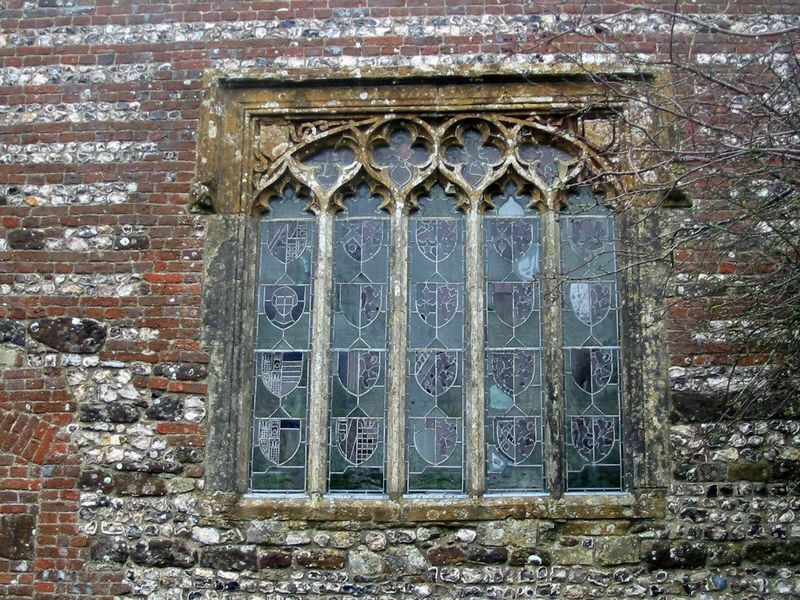 Cinquefoil Headed window & Triangular Headed window (click to enlarge photographs) The late 15th century work cannot be left without considering the magnificent nave roof of about 1485 in greater detail. As it is so unique for this part of the country, there is a separate section covering the roof alone which you can find by clicking here or by using the menu on the left. The 16th Century The Church in 1500 In about 1500 work was begun on the new west tower and the east end of the north aisle or Morton Chapel. Although at opposite ends of the building, these two items were connected, insofar as it is supposed that the original llth century north transept had been heightened in the 13th or 14th centuries to form a tower, and that this tower would have been retained until replaced by a new one. Early 16th Century Floor Plan The work carried out on the north aisle and nave at the end of the previous century must have been completed several years before 1500 as there is a distinct difference in the style of the work. This is particularly noticeable in the north aisle and nave clerestory where the earlier 15th century windows have cinquefoil and trefoil headed lights, and the later windows of the Morton Chapel and the associated nave clerestory window have plain heads (Left & right photographs below respectively - click to enlarge). Morton Chapel window & associated Nave Clerestory window The old west wall of the nave seems to have been rebuilt, or at least thickened, as it now encroaches into the nave to partially obscure the springing of the older western arch of the north arcade. 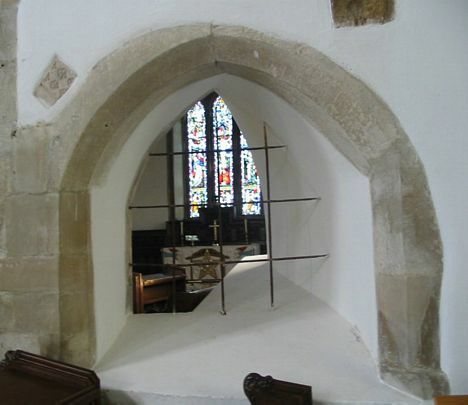 In this new or thickened wall a large arch with tracery panelled soffite and reveals was constructed, and at its apex an attempt seems to have been made to reach a compromise where the central axes of the tower and nave do not coincide. Apart from the adaptation of the west wall of the nave, the tower was treated as a simple addition. It is a splendid tower in three stages externally faced with chequered ashlar and flint-work, with battlemented and pinnacled top, and the brown ferruginous stone used in the upper stage gives the tower its distinctive appearance. The stair turret is on the north west corner and there are buttresses on each face near the angles which terminate as attached pinnacles in the upper stage. 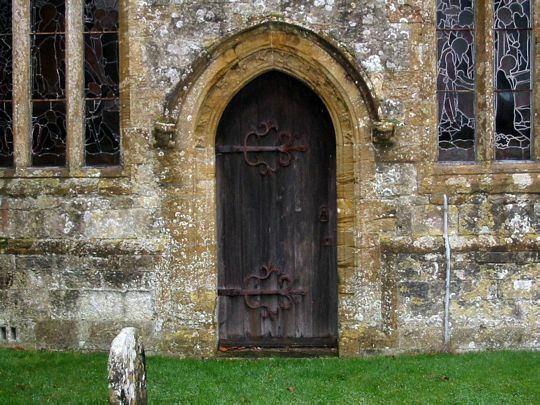 A pierced stone belfry window occurs on each face and there is a large window (below left) over the west door (below right) flanked by canopied niches which would have originally contained carved figures. The West window & the West door (click to enlarge) At the east end of the north aisle most of the old tower was taken down, leaving its south wall below the nave eaves level to form the new section of clerestory walling, and into which was inserted a new clerestory window. It matches the remaining late 15th century clerestory windows in size but not in detail, being constructed in early 16th century fashion with plain headed lights, as were the two new windows in the north and east walls of the Morton Chapel. 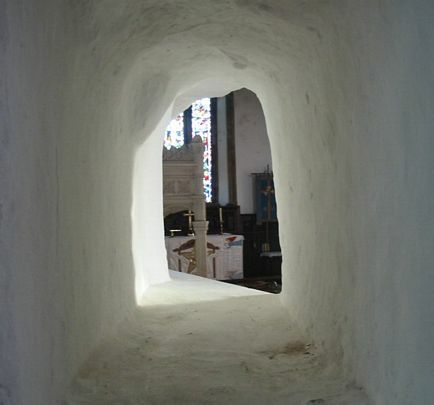 At the same time a new stair turret was formed to gain access to the existing rood loft, previous access to which could have been by way of an upper chamber in the old tower. 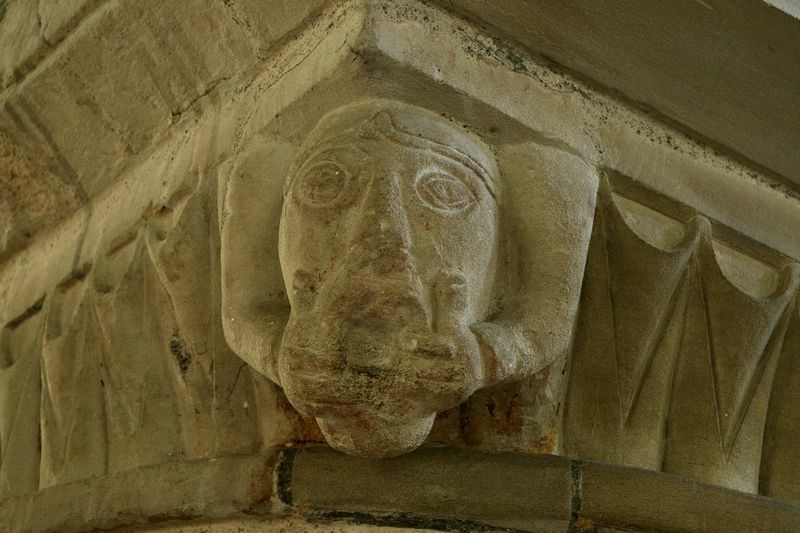 In the chapel there are two semi-octagonal stone brackets flanking the east window, and a further stone bracket decorated with a carved angel attached to the east reveal of the north window. The roof was a shallow double pitched roof continuous with that over the remainder of the north aisle, and when the whole aisle was later re-roofed in monopitch form, the old portion over this eastern bay was retained beneath it and still exists. 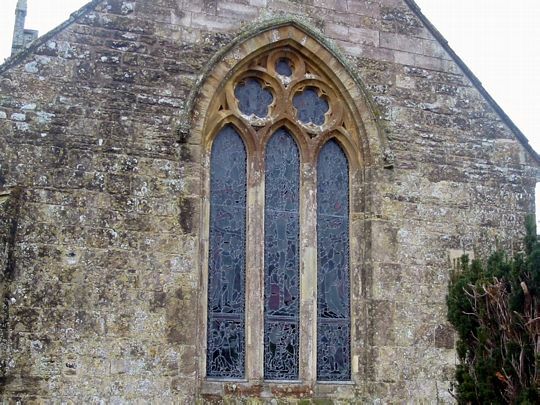 In Cardinal Morton's will, proved in 1500, it was directed that a chantry chapel should be founded in Bere Regis church, with a priest to say Mass for the souls of his parents for twenty years. The south porch is thought to have been added early in this century, but as it was almost entirely rebuilt in 1875, its date is difficult to determine. At least it seems to have been added after the widening of the south aisle as there are unbonded joints at its junction with the main wall. Early in the 16th century the 14th century east window of the south aisle was replaced by a five light square headed window presumably to admit more light. It was again replaced in 1875 but may be seen in a pre-1875 photograph. In his will of 1535 John Turberville directed that his body should be buried "in my own aisle before the image of Our Blessed Lady, in one of the tombs wherein Sir Richard and Sir Robert Turberville my ancestors hath been buried". 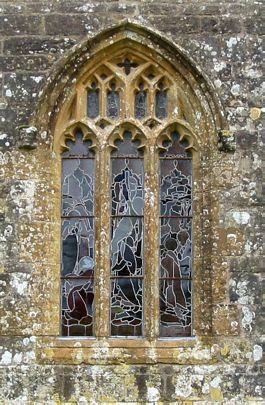 In addition, he directed that the east window of the aisle should be rebuilt and reglazed. 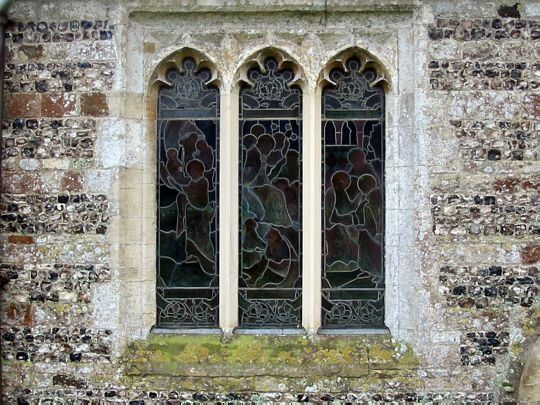 It is thought that the `Turberville window' (below left) was the result of this direction, and presumably also the canopied altar tomb memorial below it (below right). The Turbeville window & the canopied Altar Tomb (click to enlarge) Another apparently older altar tomb (See photograph below) occurs in the east wall of this aisle, but in both cases the identifying brasses have disappeared, leaving the rivet holes, as Thomas Hardy put it "like martin-holes in a sand cliff". One Turberville brass does however remain, that to Robert Turberville who died in 1559, although it is now fixed in a less vulnerable position on the wall near the floor slab to which it was formerly attached. Altar Tomb (click to enlarge) Two further canopied altar tombs formerly existed at the east end of the north aisle, but the brasses were already missing by about 1770 when Hutchins visited the church, and he considered them to have been memorials to the Willoughby family of Turnerspuddle. Sir William Willoughby, Nicholas Willoughby and Leonard Willoughby, between 1512 and about 1570, all ordered their bodies to be buried in this church. The remains of one of these canopied tombs are built into the north wall of the north aisle, consisting of the back with its housings for brasses, and the carved soffite of the canopy. A carved fragment now built into the wall in the porch could also have originally formed part of this tomb. The Skerne canopied altar tomb (See below - click to enlarge) on the north wall of the chancel is similar in design to the others, but it is in white free- stone and in an almost perfect state of preservation. The brasses are all intact bearing the date 1596, and around the edges of the slab are mortises which originally held iron trefoil guards, one of which remains in a flattened condition. The Skerne family held land at Winterborne Kingston, and had descended from a branch of the Spanish kings of Castile and Leon. They were established at Winterborne Kingston at least by 1458 when Robert Skerne held the manor there, and John Skerne, whom this monument commemorates, seems to have been the last of his line, dying in 1593. The Skerne Canopied Altar Tomb Some 16th century bench ends still exist (See below - click to enlarge), and had been incorporated in the reading pew prior to 1875, but they now form panels in the backs of the front blocks of nave pews. They are beautifully carved with arabesques and tracery, and one depicts an eagle feeding its young, whilst another bears the date 1547 in Roman numerals-McccccxLVII. 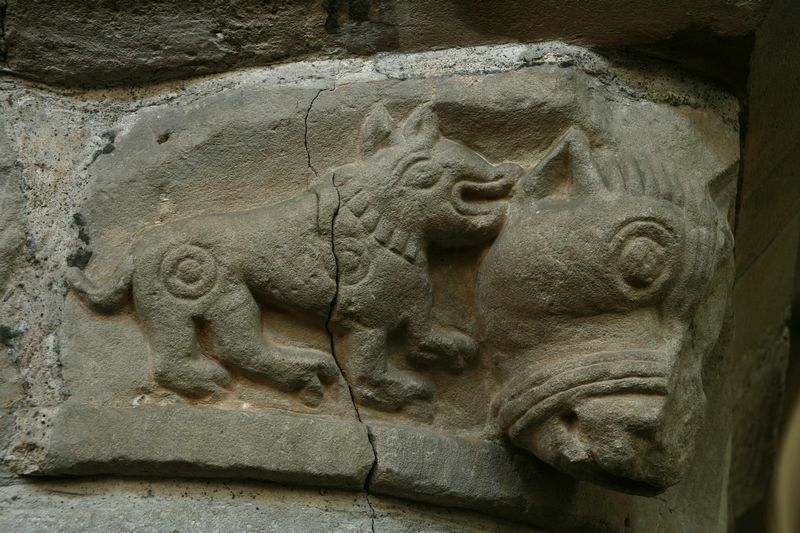 Some include carved initials, and another bears the inscription ION DAV WARDEN OF THYS CHARYS, the last word appearing to be a compromise between church and parish. Ion Dav was John Dau or Daw who occurs in the Bere Regis muster roll for 1542, and a namesake who was churchwarden here in 1656 was doubtless one of his descendants. 16th Century Pew Ends More old carved woodwork remains in the form of linen-fold panels now incorporated into the lower section of the screen which forms the south side of the vestry. Below is an example of one of the beautifully carved Pew Ends. Pew End Detail (click to enlarge) The 17th Century With the completion of the west tower and Morton Chapel early in the 16th century, the church was brought to its full development, and all subsequent work has been concerned solely with repairs, renewals, and the installation of fittings and various amenities. 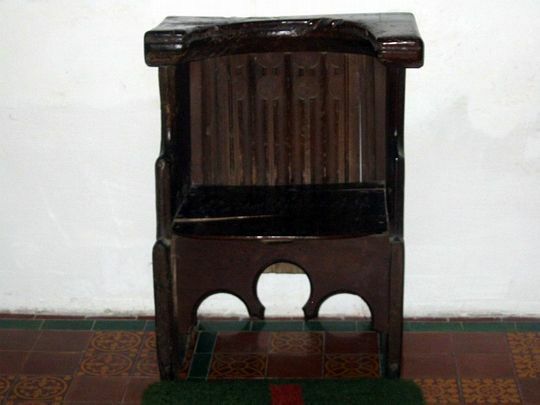 Many of such items have also been removed at various times, and the Reformation of the mid 16th century caused the removal of many of the church's ancient fittings including the old rood loft, various carved images, church plate and ceremonial robes, besides the stone altar top which in 1875 was rediscovered and restored to its original position. At the Reformation it had been effectively concealed by being disguised as a paving slab in the floor. When the old 17th century pulpit was removed in 1875, its six panels, together with others from the readers desk and box pews, were retained and mounted as panelling on the north wall of the vestry. The pew panels are quite plain, but those of the pulpit are intricately carved with semi-circular arches and columns, decorated with strapwork patterns. (See below - click to enlarge) The Pulpit Many details of 17th century repair work and other items are referred to in the old churchwardens accounts which cover the period from 1608 to 1740, and the following information is extracted from them. 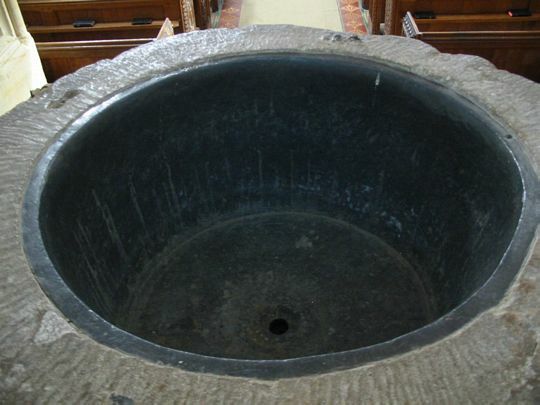 In 1608 there is an item concerning the font-"A cover for the vante given to the Church by John Hony". John Hony was a carpenter, and the present visible damage to the top of the font is probably the result of fitting this cover. In 1610 the bells and frame were completely overhauled and repaired, Thomas Kinston from Salisbury being employed on the work for 14 days with local help, which cost altogether over £11. The workmen appear to have originally underestimated the cost of the work, for there is this odd item-"pd them over & a boufe or else they wold a loste by ett for I promised them befcr thaye tocke ett thay shold nott losse by ett or eles thay wold nott tacking ett att so lowe a prise ... 6s. Od.". In 1624 £9 ls. 6d. was spent in repairs to the leadwork on the roof, and in 1628 a further £39 was spent when almost 52 tons of lead was used. A plumber named John Gaylard was employed for this work. In 1632 and 1633 these items occur: It. paid unto Mr. Davies for painting of the Kings Ma : es Armes and for other worke done about the Church ......... £ 4 Os. Od. It. Paid unto a Painter of Sarum that came to view Mr. Davies worke ....... 7s. 8d. It, In our hands to Pay Davyes .............................. £ 4 Os. Od. It appears that Mr. Davies was paid £8 altogether, and in view of the largeness of the sum for this period, his work might well have included painting the nave roof, especially as supervision from Salisbury seems to have been necessary. Hutchins, writing in about 1770, observed: "About a century subsequent to its erection, the roof appears to have been painted by some uneducated artist with rude conceptions of Italian character." In 1656 the whole of the tower, bells and frame were again overhauled and repaired, when the present second bell was cast, and in 1685 much carpentry work was done, which included repairs to the pews and apparently re-roofing the porch. In 1688, after severe gales, these items occur: paid Nicholas Huchings for minding the windows and ponting after the great wind .............................. £ 0 3s. 4d. paid Edward mores for minding and pinting after the wind ......... £ 0 Is. 6d. paid David Guy and men when the Church foundred ... £ 0 4s. 6d. for beere ............................................................ £ 0 Os. 6d. A large re-roofing job seems to have been undertaken in 1692 when Thomas Turberville was one of the churchwardens. Among the more expensive items we find: pd, Tho : Meader for 500 foot of Oaken board ......... £ 3 15s. Od. pd. Bernard Maber for 140 Bushells of Lime ............ £ 2 6s. Od. pd. Tho: & James Lockier towards their worke ......... £ 4 Is. 8d. pd. Wm : Woolfrys for fetchinge 7000 of bricks ...... £ 1 3s. 4d. pd. Robt. Strangman for 7000 of bricks .................. £ 4 4s. Od. pd. for Timber bought at Clenston & marking money ... £ 4 18s. Od. pd. ffor Lead & the Plumbers worke ..................... £13 6s. 7d. As a result of this heavy expenditure Thomas Turberville seriously overspent on his year's account, causing him to remark somewhat apologetically at the end: "So that there is disburst by Tho : Turbeville Esqr., more yn. recd. £13 7s. 9d. ", besides which he had not paid for the plumber's 'Dyett & Horsemeat' and a number of other items. Bere Regis has suffered badly from fires on several occasions, the worst ones being in 1633, 1717 and 1788. The Fire Hooks below (click to enlarge) were used to strip thatch from roofs to act as a firebreak. These particular ones were stored in the Church and were used from the 17th Century onwards. 17th Century Fire Hooks The 18th Century Again details of some of the work carried out in this century can be found in the churchwardens accounts which cover almost the first half of the century up to 1740. In 1708 these items occur: It. Pd. for White-liming of ye Church ..................... £ 1 2s. Od. It, Pd. Edward Meader & John Ash for building the seats ............................................................... £ 5 lOs. 6d. It. Pd, for 60deal boards to Mrs. Seaward ............ 4 lOs. Od. It appears from the 1711 account that about £14 worth of leadwork was carried out on the roof and roof of the tower, and in 1712 over £28 was paid to Richard Ham, a plumber, for recasting and relaying lead on the roof. He was paid a further £14 for similar work in 1715, and £19 in 1719. The parish chest (See below - click to expand) which stands in the north aisle was made in 1716, and it bears this date and the names of the churchwardens Lawrence Harris and Robert Spear. The names are carved in the wood, and many of the letters are back to front. In the account for this year there is this item: "It. George Smethe for ye Coffer ............... 12s. Od." The Parish Chest This chest has three locks, numbered 1, 11 and 111, and long bolts incorporated in the back presumably for fixing to a wall. Separate keys were held by the Vicar and each church warden so that the chest could be opened only in the presence of all three. The old church clock (See below - click to enlarge) now in the County Museum at Dorchester, was made in 1719 by Lawrence Boyce, a Puddletown blacksmith, and it bears this inscription on the frame: ROBERT FRAMPTON AND JOSHUA GOLLOP, CHURCHWARDENS ANNO DOMINI 1719 LAWRENCE BOYCE PIDDLETOWN FECIT 1719. By referring to the account for this year we find: "Pd. Mr. Boys for the Clock ............ £14 Os. Od.". The Old Church Clock This was a very large sum indeed in the 18th century, and in addition Mr. Boyce was paid five shillings each year when he came to clean and service the clock, at least until 1740 when the accounts end. This clock continued in use until 1878 when the present one was installed, but an earlier clock existed before 1719 as there are items in the accounts regarding it as far back as 1608. There seems to have been further gale damage in 1734: Paid Benj. 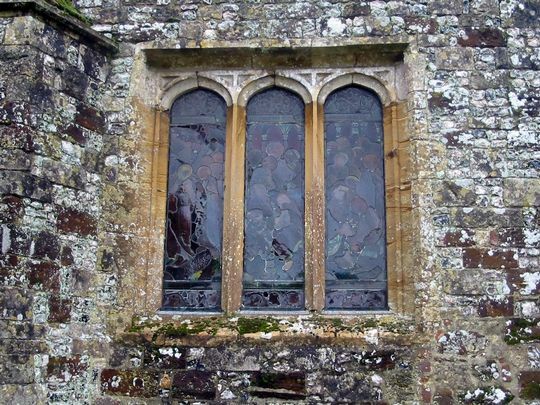 Moors for Glasing and Cleaning of the North side of the Church windows just after the great storm £ 1 Os. Od. Paid Porters Bill for work about the Monument & the Tower and Cleaning all the Body of the Church and Walling up the east end of the Church and for plaistering of it also and for Hair for all the work .................. £ 2 is. 9d. In 1738 more repair work was done: Pd. James Burges for 600 paving brick for ye Church Porch ...... £ 0 12s. Od. Pd. for 120 bushels of Lime for the Church ............ £ 2 Os. Od. for the Carriage of 2 load of Lime ........................ £ 1 Os. Od. Paid Henry Porter and His son their bill for plaistering the Church .... £ 4 16s. lOd. Pd. Henry Porter for 10 bushels of white hair ......... £ 0 15s. Od. Paid Hen. Porters wife for helping to clean the Church and for use of his poles for Scafling .................. £ 0 2s. 6d. Paid Benjamin Moores for helping Hen. Porter 8 days £ 0 8s. Od. Paid Benjamin Moores for Cleaning & Oyling the Apostles ....... £ 0 4s. Od. There are further items bringing the total on this occasion to over £20. The vestry table which is still in use, was made by the Rev. Henry Fisher, vicar from 1725 until his death in 1773 aged 90. It is reputed to have been made from a yew treewhich grew in the churchyard, and as it is unlikely to have been made in Mr. Fisher's later years it probably dates from between 1725 and 1750. It bears the gilt painted inscription HFV Dedit Dedicat q. Some rebuilding work to the south aisle would appear to have been carried out in 1760, as a stone on the east end bears that date and the initials MS. The 19th Century The Church in 1875 In the county museum at Dorchester there is an early 19th century barrel organ formerly used in Bere Regis church. It was purchased second hand from the churchwardens of Puddletown in 1852, and continued in use on a gallery at the back of the church until about 1865 when a small conventional organ was installed in the chancel. Somehow or other this old barrel organ found its way to Upwey, and in 1908 it was offered to the parishioners of Bere Regis, but no one seems to have been interested in recovering it. The organ was used by turning a handle on the front which both rotated the barrel inside and operated the bellows. Tunes were produced by a system of valves at the ends of the pipes actuated in a set order by metal projections on the revolving wooden barrel, and the tune was changed by moving the barrel sideways. There were ten different tunes on each barrel, and three barrels survive, but originally there were probably more. 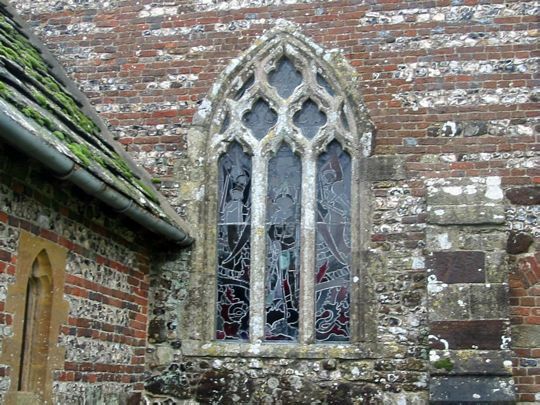 Due largely to the effects of the Industrial Revolution the early part of the 19th century saw a great decline generally in the population and prosperity of country districts, with the result that village churches no longer received the care which had been formerly given to them. Bere Regis church was no exception, and by 1870 it was in a very poor condition indeed after years of neglect. The roof leaked in many places, the woodwork was in consequence suffering badly from rot, stonework was crumbling, and most of the windows were broken. Late 19th Century Floor Plan It was therefore decided to thoroughly restore the church, and in March 1873 the Rev. Francis Warre sent out a circular letter appealing for funds, and a committee was formed to arrange the restoration of the nave and north aisle. Mrs. Lloyd Egginton as chief proprietor of the parish undertook to restore the chancel and south aisle at her own expense. Sir George E. Street, R.A., one of the foremost national architects of the day, was commissioned to prepare a scheme and supervise the work and Messrs. Hale of Salisbury were the building contractors. £2,485 was spent on the chancel and south aisle, and £2,605 was collected in subscriptions for the remainder of the work. The restored church was re-opened on Thursday, 7 October, 1875, when the Bishop preached at morning service, and lunch and tea were provided for 1,700 parishioners and guests. Another thanksgiving service was held at 6 p.m. on the same day, and for many years afterwards a combined thanksgiving and harvest service was held on the first Thursday in each October to commemorate the restoration. Although Sir George Street ensured that as much as possible of the old work was retained, a large amount of rebuilding was nevertheless carried out, and as a result the church lost much of its mediaeval character, especially internally. It is fortunate, however, that two pre-1875 photographs survive, one internal and one external, and with Street's plan of the building as it existed, now housed in the Diocesan Registry at Salisbury, a good idea of the church's pre-restoration appearance can be formed. The following work was carried out in 1875: Chancel. The unstable north wall was underpinned with a concrete foundation, and the upper part of the east window was renewed together with the apex of the gable. At the same time the whole of the chancel roof was renewed, and it is unfortunate that no record seems to exist of its form before this date, although the new roof was claimed to have been a copy of a former mediaeval roof deduced from one or two remains found at the time. The old organ which stood on the north side was removed to the east end of the north aisle, and the clergy stalls and one bay of choir stalls were put in. The altar and rail were removed and replaced, with the old pre-reformation stone altar top incorporated in the new work. North Aisle. 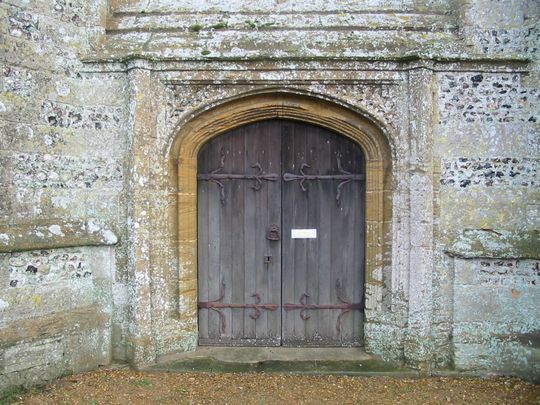 The whole of the north wall, except the eastern bay, was rebuilt, the original 15th century windows being repaired and re-used, and the north doorway was similarly re-used some ten feet (3m) west of its former position. South Aisle. The 15th century square headed east window was removed and replaced by the present one (See below - click to enlarge), and the east gable was largely rebuilt. 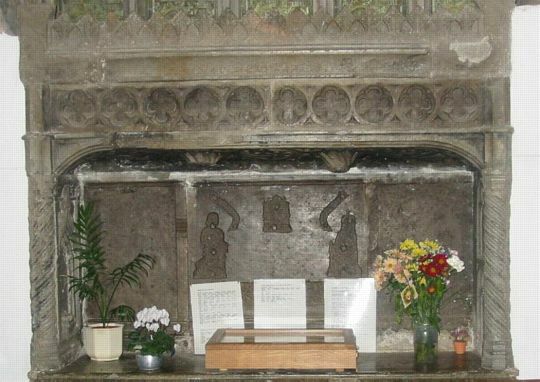 The Turbeville window & the canopied Altar Tomb (click to enlarge) Another apparently older altar tomb (See photograph below) occurs in the east wall of this aisle, but in both cases the identifying brasses have disappeared, leaving the rivet holes, as Thomas Hardy put it "like martin- holes in a sand cliff". 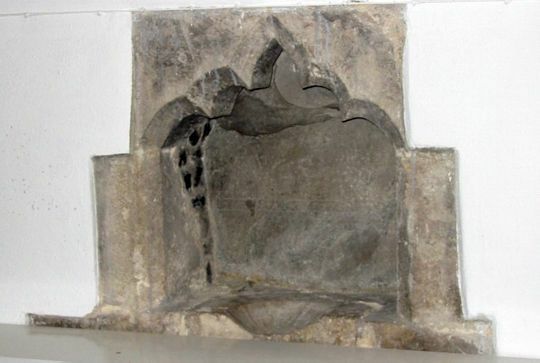 One Turberville brass does however remain, that to Robert Turberville who died in 1559, although it is now fixed in a less vulnerable position on the wall near the floor slab to which it was formerly attached. Altar Tomb (click to enlarge) Two further canopied altar tombs formerly existed at the east end of the north aisle, but the brasses were already missing by about 1770 when Hutchins visited the church, and he considered them to have been memorials to the Willoughby family of Turnerspuddle. Sir William Willoughby, Nicholas Willoughby and Leonard Willoughby, between 1512 and about 1570, all ordered their bodies to be buried in this church. The remains of one of these canopied tombs are built into the north wall of the north aisle, consisting of the back with its housings for brasses, and the carved soffite of the canopy. A carved fragment now built into the wall in the porch could also have originally formed part of this tomb. 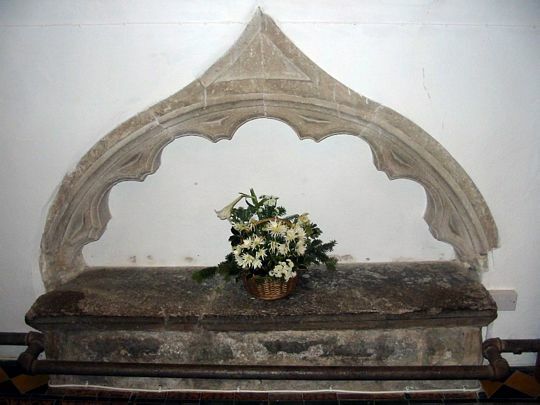 The Skerne canopied altar tomb (See below - click to enlarge) on the north wall of the chancel is similar in design to the others, but it is in white free- stone and in an almost perfect state of preservation. The brasses are all intact bearing the date 1596, and around the edges of the slab are mortises which originally held iron trefoil guards, one of which remains in a flattened condition. The Skerne family held land at Winterborne Kingston, and had descended from a branch of the Spanish kings of Castile and Leon. They were established at Winterborne Kingston at least by 1458 when Robert Skerne held the manor there, and John Skerne, whom this monument commemorates, seems to have been the last of his line, dying in 1593. The Skerne Canopied Altar Tomb Some 16th century bench ends still exist (See below - click to enlarge), and had been incorporated in the reading pew prior to 1875, but they now form panels in the backs of the front blocks of nave pews. They are beautifully carved with arabesques and tracery, and one depicts an eagle feeding its young, whilst another bears the date 1547 in Roman numerals-McccccxLVII. Some include carved initials, and another bears the inscription ION DAV WARDEN OF THYS CHARYS, the last word appearing to be a compromise between church and parish. Ion Dav was John Dau or Daw who occurs in the Bere Regis muster roll for 1542, and a namesake who was churchwarden here in 1656 was doubtless one of his descendants. 16th Century Pew Ends More old carved woodwork remains in the form of linen-fold panels now incorporated into the lower section of the screen which forms the south side of the vestry. Below is an example of one of the beautifully carved Pew Ends. Pew End Detail (click to enlarge) The 17th Century With the completion of the west tower and Morton Chapel early in the 16th century, the church was brought to its full development, and all subsequent work has been concerned solely with repairs, renewals, and the installation of fittings and various amenities. 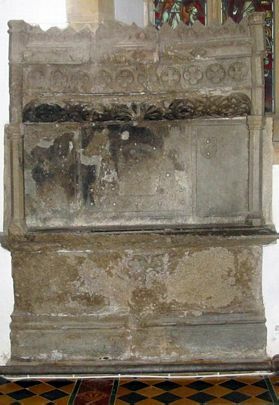 Many of such items have also been removed at various times, and the Reformation of the mid 16th century caused the removal of many of the church's ancient fittings including the old rood loft, various carved images, church plate and ceremonial robes, besides the stone altar top which in 1875 was rediscovered and restored to its original position. At the Reformation it had been effectively concealed by being disguised as a paving slab in the floor. 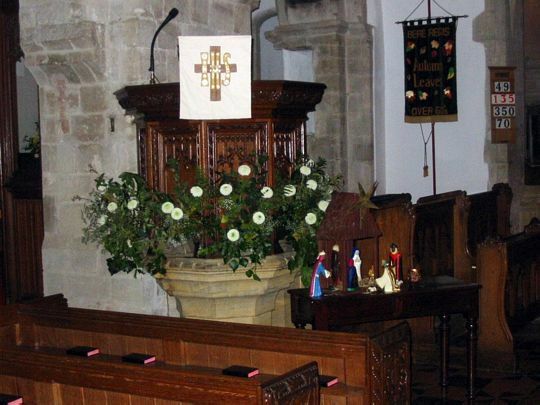 When the old 17th century pulpit was removed in 1875, its six panels, together with others from the readers desk and box pews, were retained and mounted as panelling on the north wall of the vestry. 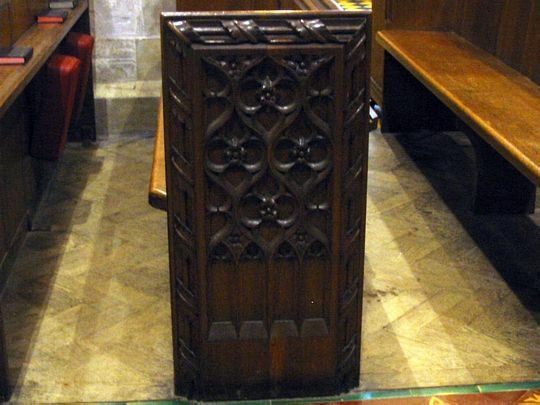 The pew panels are quite plain, but those of the pulpit are intricately carved with semi- circular arches and columns, decorated with strapwork patterns. (See below - click to enlarge) The Pulpit Many details of 17th century repair work and other items are referred to in the old churchwardens accounts which cover the period from 1608 to 1740, and the following information is extracted from them. 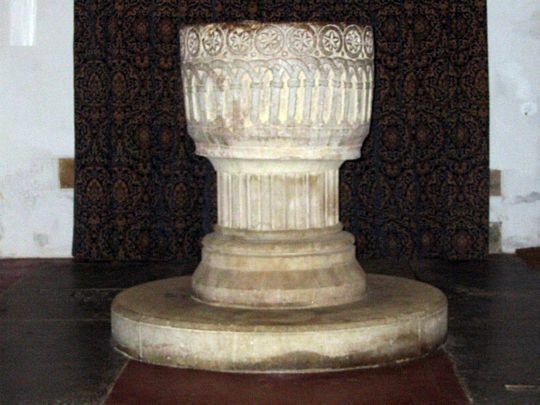 In 1608 there is an item concerning the font-"A cover for the vante given to the Church by John Hony". John Hony was a carpenter, and the present visible damage to the top of the font is probably the result of fitting this cover. In 1610 the bells and frame were completely overhauled and repaired, Thomas Kinston from Salisbury being employed on the work for 14 days with local help, which cost altogether over £11. The workmen appear to have originally underestimated the cost of the work, for there is this odd item-"pd them over & a boufe or else they wold a loste by ett for I promised them befcr thaye tocke ett thay shold nott losse by ett or eles thay wold nott tacking ett att so lowe a prise ... 6s. Od.". In 1624 £9 ls. 6d. was spent in repairs to the leadwork on the roof, and in 1628 a further £39 was spent when almost 52 tons of lead was used. A plumber named John Gaylard was employed for this work. In 1632 and 1633 these items occur: It. paid unto Mr. Davies for painting of the Kings Ma : es Armes and for other worke done about the Church ......... £ 4 Os. Od. It. Paid unto a Painter of Sarum that came to view Mr. Davies worke ....... 7s. 8d. It, In our hands to Pay Davyes .............................. £ 4 Os. Od. It appears that Mr. Davies was paid £8 altogether, and in view of the largeness of the sum for this period, his work might well have included painting the nave roof, especially as supervision from Salisbury seems to have been necessary. Hutchins, writing in about 1770, observed: "About a century subsequent to its erection, the roof appears to have been painted by some uneducated artist with rude conceptions of Italian character." In 1656 the whole of the tower, bells and frame were again overhauled and repaired, when the present second bell was cast, and in 1685 much carpentry work was done, which included repairs to the pews and apparently re-roofing the porch. In 1688, after severe gales, these items occur: paid Nicholas Huchings for minding the windows and ponting after the great wind .............................. £ 0 3s. 4d. paid Edward mores for minding and pinting after the wind ......... £ 0 Is. 6d. paid David Guy and men when the Church foundred ... £ 0 4s. 6d. for beere ............................................................ £ 0 Os. 6d. A large re-roofing job seems to have been undertaken in 1692 when Thomas Turberville was one of the churchwardens. Among the more expensive items we find: pd, Tho : Meader for 500 foot of Oaken board ......... £ 3 15s. Od. pd. Bernard Maber for 140 Bushells of Lime ............ £ 2 6s. Od. pd. Tho: & James Lockier towards their worke ......... £ 4 Is. 8d. pd. Wm : Woolfrys for fetchinge 7000 of bricks ...... £ 1 3s. 4d. pd. Robt. Strangman for 7000 of bricks .................. £ 4 4s. Od. pd. for Timber bought at Clenston & marking money ... £ 4 18s. Od. pd. ffor Lead & the Plumbers worke ..................... £13 6s. 7d. As a result of this heavy expenditure Thomas Turberville seriously overspent on his year's account, causing him to remark somewhat apologetically at the end: "So that there is disburst by Tho : Turbeville Esqr., more yn. recd. £13 7s. 9d. ", besides which he had not paid for the plumber's 'Dyett & Horsemeat' and a number of other items. Bere Regis has suffered badly from fires on several occasions, the worst ones being in 1633, 1717 and 1788. The Fire Hooks below (click to enlarge) were used to strip thatch from roofs to act as a firebreak. These particular ones were stored in the Church and were used from the 17th Century onwards. 17th Century Fire Hooks The 18th Century Again details of some of the work carried out in this century can be found in the churchwardens accounts which cover almost the first half of the century up to 1740. In 1708 these items occur: It. Pd. for White-liming of ye Church ..................... £ 1 2s. Od. It, Pd. Edward Meader & John Ash for building the seats ............................................................... £ 5 lOs. 6d. It. Pd, for 60deal boards to Mrs. Seaward ............ 4 lOs. Od. It appears from the 1711 account that about £14 worth of leadwork was carried out on the roof and roof of the tower, and in 1712 over £28 was paid to Richard Ham, a plumber, for recasting and relaying lead on the roof. He was paid a further £14 for similar work in 1715, and £19 in 1719. The parish chest (See below - click to expand) which stands in the north aisle was made in 1716, and it bears this date and the names of the churchwardens Lawrence Harris and Robert Spear. The names are carved in the wood, and many of the letters are back to front. In the account for this year there is this item: "It. George Smethe for ye Coffer ............... 12s. Od." The Parish Chest This chest has three locks, numbered 1, 11 and 111, and long bolts incorporated in the back presumably for fixing to a wall. Separate keys were held by the Vicar and each church warden so that the chest could be opened only in the presence of all three. The old church clock (See below - click to enlarge) now in the County Museum at Dorchester, was made in 1719 by Lawrence Boyce, a Puddletown blacksmith, and it bears this inscription on the frame: ROBERT FRAMPTON AND JOSHUA GOLLOP, CHURCHWARDENS ANNO DOMINI 1719 LAWRENCE BOYCE PIDDLETOWN FECIT 1719. By referring to the account for this year we find: "Pd. Mr. Boys for the Clock ............ £14 Os. Od.". The Old Church Clock This was a very large sum indeed in the 18th century, and in addition Mr. Boyce was paid five shillings each year when he came to clean and service the clock, at least until 1740 when the accounts end. This clock continued in use until 1878 when the present one was installed, but an earlier clock existed before 1719 as there are items in the accounts regarding it as far back as 1608. There seems to have been further gale damage in 1734: Paid Benj. 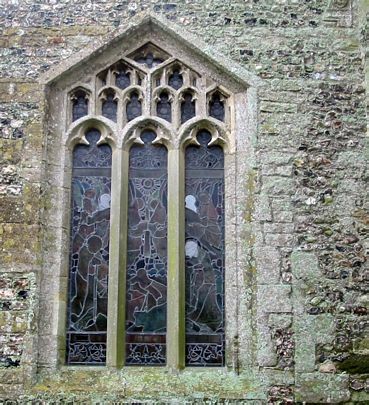 Moors for Glasing and Cleaning of the North side of the Church windows just after the great storm £ 1 Os. Od. Paid Porters Bill for work about the Monument & the Tower and Cleaning all the Body of the Church and Walling up the east end of the Church and for plaistering of it also and for Hair for all the work .................. £ 2 is. 9d. In 1738 more repair work was done: Pd. James Burges for 600 paving brick for ye Church Porch ...... £ 0 12s. Od. Pd. for 120 bushels of Lime for the Church ............ £ 2 Os. Od. for the Carriage of 2 load of Lime ........................ £ 1 Os. Od. Paid Henry Porter and His son their bill for plaistering the Church .... £ 4 16s. lOd. Pd. Henry Porter for 10 bushels of white hair ......... £ 0 15s. Od. Paid Hen. Porters wife for helping to clean the Church and for use of his poles for Scafling .................. £ 0 2s. 6d. Paid Benjamin Moores for helping Hen. Porter 8 days £ 0 8s. Od. Paid Benjamin Moores for Cleaning & Oyling the Apostles ....... £ 0 4s. Od. There are further items bringing the total on this occasion to over £20. 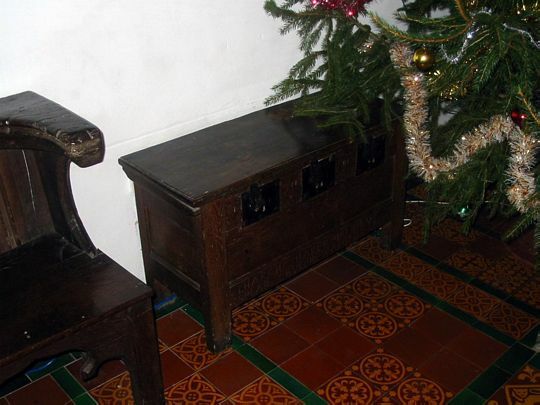 The vestry table which is still in use, was made by the Rev. Henry Fisher, vicar from 1725 until his death in 1773 aged 90. It is reputed to have been made from a yew treewhich grew in the churchyard, and as it is unlikely to have been made in Mr. Fisher's later years it probably dates from between 1725 and 1750. It bears the gilt painted inscription HFV Dedit Dedicat q. Some rebuilding work to the south aisle would appear to have been carried out in 1760, as a stone on the east end bears that date and the initials MS. The 19th Century The Church in 1875 In the county museum at Dorchester there is an early 19th century barrel organ formerly used in Bere Regis church. 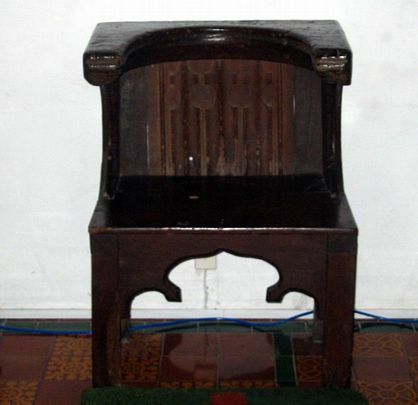 It was purchased second hand from the churchwardens of Puddletown in 1852, and continued in use on a gallery at the back of the church until about 1865 when a small conventional organ was installed in the chancel. Somehow or other this old barrel organ found its way to Upwey, and in 1908 it was offered to the parishioners of Bere Regis, but no one seems to have been interested in recovering it. The organ was used by turning a handle on the front which both rotated the barrel inside and operated the bellows. Tunes were produced by a system of valves at the ends of the pipes actuated in a set order by metal projections on the revolving wooden barrel, and the tune was changed by moving the barrel sideways. There were ten different tunes on each barrel, and three barrels survive, but originally there were probably more. Due largely to the effects of the Industrial Revolution the early part of the 19th century saw a great decline generally in the population and prosperity of country districts, with the result that village churches no longer received the care which had been formerly given to them. Bere Regis church was no exception, and by 1870 it was in a very poor condition indeed after years of neglect. The roof leaked in many places, the woodwork was in consequence suffering badly from rot, stonework was crumbling, and most of the windows were broken. Late 19th Century Floor Plan It was therefore decided to thoroughly restore the church, and in March 1873 the Rev. Francis Warre sent out a circular letter appealing for funds, and a committee was formed to arrange the restoration of the nave and north aisle. Mrs. Lloyd Egginton as chief proprietor of the parish undertook to restore the chancel and south aisle at her own expense. Sir George E. Street, R.A., one of the foremost national architects of the day, was commissioned to prepare a scheme and supervise the work and Messrs. Hale of Salisbury were the building contractors. £2,485 was spent on the chancel and south aisle, and £2,605 was collected in subscriptions for the remainder of the work. The restored church was re-opened on Thursday, 7 October, 1875, when the Bishop preached at morning service, and lunch and tea were provided for 1,700 parishioners and guests. Another thanksgiving service was held at 6 p.m. on the same day, and for many years afterwards a combined thanksgiving and harvest service was held on the first Thursday in each October to commemorate the restoration. Although Sir George Street ensured that as much as possible of the old work was retained, a large amount of rebuilding was nevertheless carried out, and as a result the church lost much of its mediaeval character, especially internally. It is fortunate, however, that two pre-1875 photographs survive, one internal and one external, and with Street's plan of the building as it existed, now housed in the Diocesan Registry at Salisbury, a good idea of the church's pre-restoration appearance can be formed. The following work was carried out in 1875: Chancel. The unstable north wall was underpinned with a concrete foundation, and the upper part of the east window was renewed together with the apex of the gable. 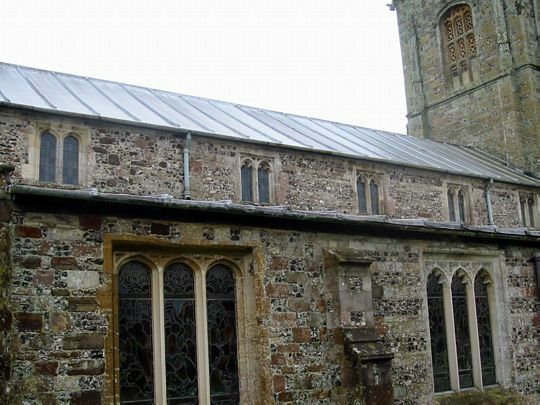 At the same time the whole of the chancel roof was renewed, and it is unfortunate that no record seems to exist of its form before this date, although the new roof was claimed to have been a copy of a former mediaeval roof deduced from one or two remains found at the time. The old organ which stood on the north side was removed to the east end of the north aisle, and the clergy stalls and one bay of choir stalls were put in. The altar and rail were removed and replaced, with the old pre- reformation stone altar top incorporated in the new work. North Aisle. 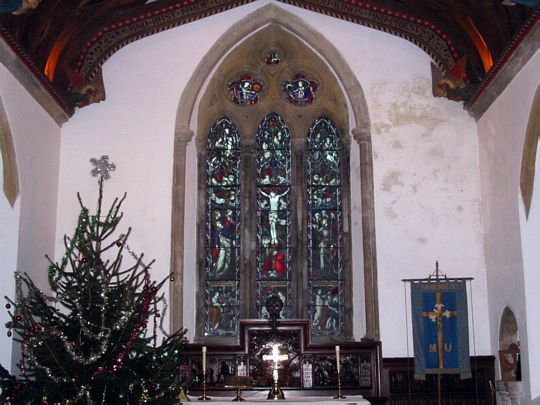 The whole of the north wall, except the eastern bay, was rebuilt, the original 15th century windows being repaired and re-used, and the north doorway was similarly re-used some ten feet (3m) west of its former position. South Aisle. 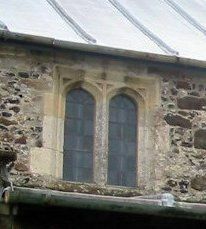 The 15th century square headed east window was removed and replaced by the present one (See below - click to enlarge), and the east gable was largely rebuilt.